United by a love of both straight-ahed jazz and R&B/Hip-Hop in the early 2000's, Alger and dynamic vocalist Typhanie Monique formed a musical and personal friendship that continues to the present day and their duo project (complete with special guests) has released three CD's that have garnered considerable critical praise: INTRINSIC (2004), IN THIS ROOM (2007), and YULETIDE GROOVE (2008). Neal made a guest appearance on Typhanie's most recent disc, the highly ambitious work CALL IT MAGIC (2017) and they perform regularly around the Chicagoland area. 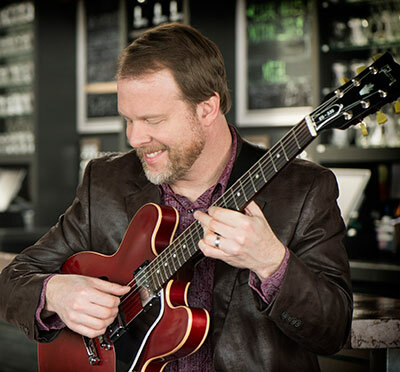 In addition to modern jazz, Neal's ever-expanding musical curiosity has led him to play in other groups that are sometimes jazz-related, sometimes not. Neal plays R&B fusion with keyboardist/singer William Kurk, rock/pop movie soundtracks with Androgynous Mustache, sophisticated pop with Steely Dan cover band Bad Sneakers Orchestra and classic rock covers with Cast Iron Skillet. While Neal currently has sufficient original music for a new jazz CD, his current focus is on the many facets of Brazilian popular music through the performances of three groups: a guitar-bass-drums trio (NEAL ALGER'S BRAZILIAN TRIO) which features jazz improvisation over songs by popular Brazilian composers, a flute-guitar duo (DUO TEMPERO BRASILEIRO) which performs an older Brazilian style called choro, and a dance-focused samba quintet (BOSSA TRES) led by vocalist Dill Costa. In addition to his busy performing schedule, Alger teaches jazz improvisation, jazz history, and coaches several groups at both Elmhurst College and Roosevelt University (Chicago).